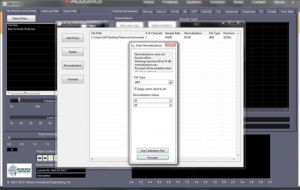 The easiest way to properly calibrate WAV files for use in Sound Quality Analyzer is to make your files using National Instruments hardware and our Trident data acquisition software. Trident embeds a “normalization” value into the header of the WAV file as it is being saved that Sound Quality Anlyzer can read when the file is retrieved for analysis. Level calibration is seamless using this method. A-weighted sound level calibration – If the overall A-weighted Leq sound pressure level of the WAV file recording is known, simply enter that sound pressure level into Sound Quality Analyzer when the file is retrieved and Sound Quality Analyzer will properly scale the file. Calibration Signal Recording – Record a WAV file with a tone or signal of a known level using the same recording input gain setting that were used to record the WAV file. Sound Quality Analyzer will use the calibration recording to generate the proper normalization term for the WAV file to be analyzed. Sound Quality Analyzer provides a method for achieving level calibration of WAV files generated from most any recording device or data acquisition system, bringing the power of sound quality and psychoacoustic analysis to users without the high cost of the hardware normally associated with such analysis.